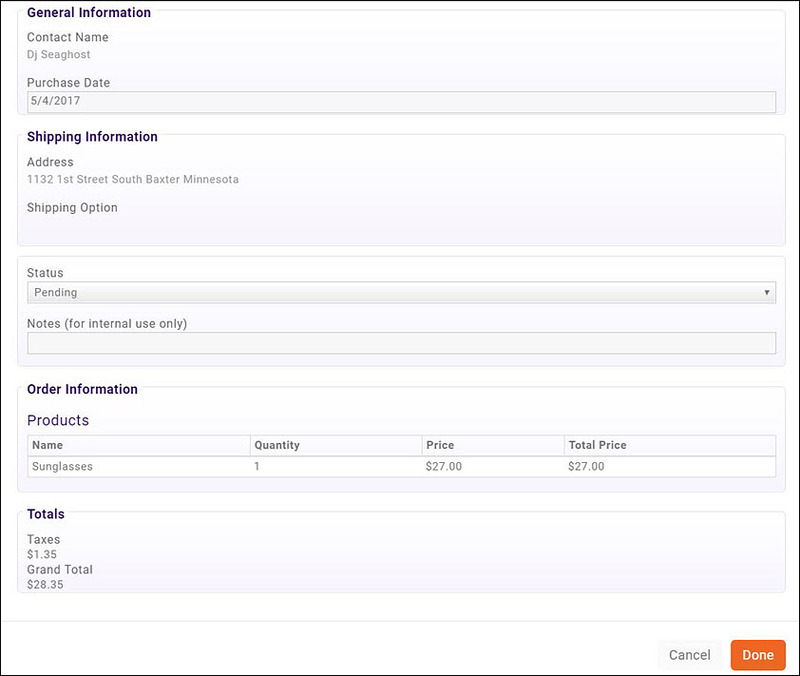 The Shipping functions allow you to set the shipping fees associated to a sale. First step is to setup pricing tiers, second is to associate those tiers to a shipping option. Access the Shipping Options via Setup > Finance > Shipping. The Price Tiers screen is where you can set up your shipping price thresholds. Each item in the Price Tier is a price range with a minimum and a maximum value. Click Shipping in the Finance section. Click the Price Tiers tab. To add a price tier, click the + button. Greater or equal than (Min) - Enter the minimum purchase dollar amount that will qualify for a designated shipping price. Less than (Max) - Enter the maximum purchase dollar amount that will qualify for a designated shipping price. Repeat the steps above to add all price tiers. On the Shipping Options tab you will create a set of shipping options, associate the price tiers, and assign the shipping cost for each tier. You may have multiple shipping option sets, for example you may have options for ground shipping, air shipping, pick up in store and so on. All of the shipping option sets that you create will automatically be available in your store at checkout. Click the Shipping Options tab. Enter a Name for the Shipping Option set. Enter a Description of the set. Select the Is Active check-box to be able to select this set. Account - Select the account to which the shipping revenue should assigned. Enter the Shipping Fee you wish to associate to each tier. Click Store in the Navigation Panel. The Entire Url will be initially blank. Once you have created the page to be added to your website, the URL will be populated. Store Description - The Store Description will be displayed at the top of your store page. Payment Gateway: If using an alternate payment gateway for your store, select it from the list. If no payment gateway is selected, your default gateway will be used. To add the store to your web-site, you will first configure the web-site page through the back office. Once the page has been configured you will add it to your web-site. 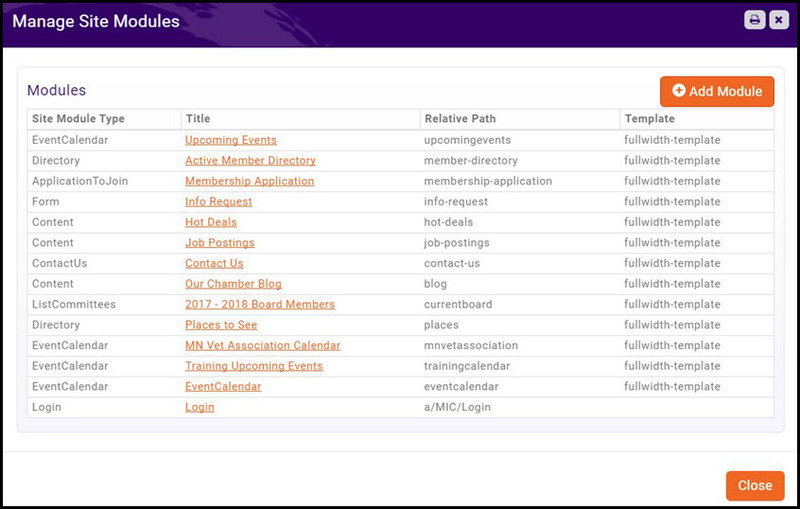 Click Sites in the Website/Content Management System section. Site Module Type: Select Store from the drop-down list. Enter the Relative Path to your store. The relative path is the final portion of the URL. The system will automatically build the full path and display in the Entire URL setting once you have save the page. Select the Template you wish to use for your store from the drop-down list. In the list of modules displayed, click the hyper-link for the store page you just created. Copy the URL for the store. In Edit mode, click the Dashboard icon in the upper left corner. Click the drop-down arrow next to Custom Links. Paste the URL to your store in the URL text box. Enter the name for this menu item in the Link Text text-box. Click Add to Menu. 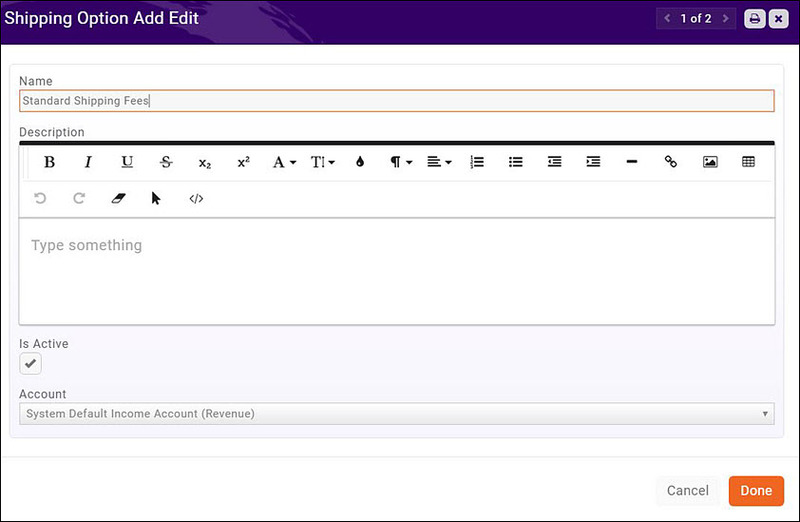 You new page menu item will be added to the menu structure shown to the right. You can re-position where it will be in the menu structure by dragging and moving it to the desired location. Goods and Services allow you to define the fee items associated to the products you will sell in your store. NOTE: You must assign your store goods/services to a Goods/Service Type of "Physical Product" or "Digital Product" to make it available when you add products to the store. Good/Service Type - Select a type from the drop-down list. Type will drive the goods/service items that may be selected when setting up the products in your store. Physical Product and Digital Product are store items. Product Category - Select a product category from the drop-down list. Product Category is used for filtering and reporting. To add a new product category, click the + sign. Price Period - Select one-time for store products. Accounting Type - Select either Cash or Accrual. Revenue Recognition Type - Select how you will recognize the revenue for this good/service. Deferred Income Account - Select the deferred income account for this good/service. The drop-down list will be populated with the deferred income accounts configured in you Chart of Accounts. Is Recurring Fee (vs. one-time) - Does not apply to store purchases. Is Active - Select this check-box to activate this good/service. Only Active items may be billed. In the Store module, click the Products tab. A list of all products currently setup in your system will be displayed. Name - This is the name of the product that will be displayed on the public web-site. Saleable Item - Select the good/service fee associated to this product. 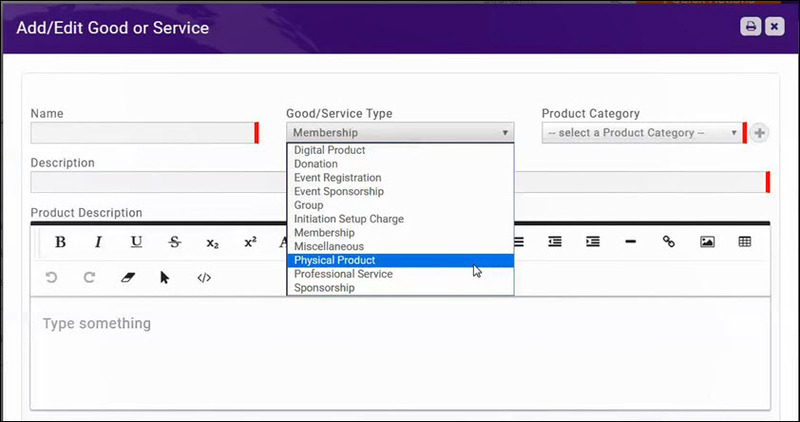 Good/Services that you have created as Physical Product or Digital Product will be displayed in the drop-down. You can add a new Good/Service by clicking the + button. Category Item - Select a category item from the drop-down. Category will allow for reporting and filtering. Description - Enter a description of this product. The description will be displayed on your public web-site, when someone clicks on the item. Short Description - Enter a short description. 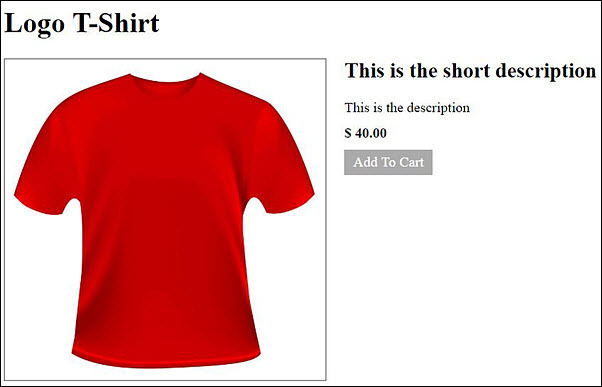 The short description will be displayed above the Description when someone clicks on the item on your public web-page. Is Active - Select this check-box to display this item in your store. If the item is no longer available, you can deselect this option. Price - Enter the price of the item. On the Products tab, click the hyper-link for the product to which you wish to add an image. In the Images section, click the Add button. Drag and drop the image, or click Upload to browse to the file and upload it. If necessary, crop the image. You may add additional images by clicking the Add button again, and completing the steps above. When an order is placed, an automated message will be sent to those staff members who have subscribed to the New Store Order Created notification. Click here for details on setting up notifications. 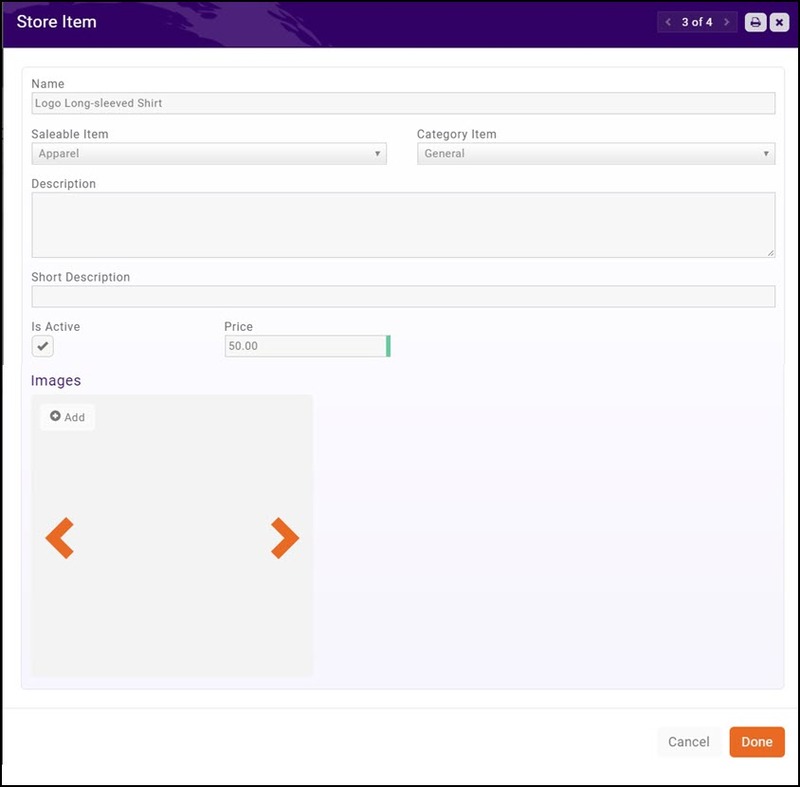 All orders placed through your store will be displayed on the Orders tab of the Store module. Click into the Purchaser's Name on the Orders tab. Select Fulfilled from the Status list. If no selection is made, the order will remain in Pending. (Optional) Enter Notes. Notes are for internal use and may be a way to track when an order was completed, or other details. The Store Product Purchases report will generate a list of all product sold through your store. This list can be generated for an individual contact, or all contacts. Additionally you can filter the report on specific products and/or specific date ranges. Select the Store Product Purchases Report. 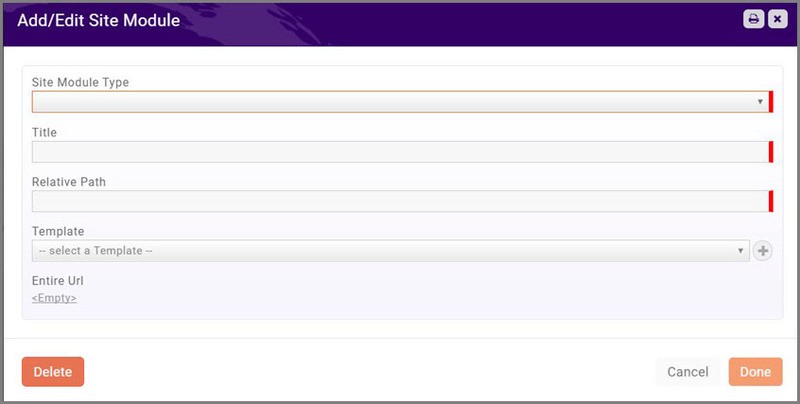 To view purchases for an individual contact, begin typing the name in the Contact Name text box. If the contact exists in your database, the type ahead functionality will display a list of contacts for you to choose from. If Contact Name is left blank, the report will be generated for all contacts who have made purchases. To view purchases in a particular date range, select a predefined date range (i.e. Last Week, Last Quarter, etc.) or select beginning and end dates from the calendars. To view purchases for a selected product, begin typing the name of the product in the Product Name text box. If the product exists in your database, the type ahead functionality will display a list of products for you to choose from. If Product Name is left blank, the report will be generated for all products sold. You may select additional Criteria / Filters to customize the results of your report. By default the Fields to Display in the report include: Order Date, Short Description, Quantity, Total Amount, and Contact Name. You may change or add additional fields to your report by clicking into the Fields to Display box. The Summarize By option allows you to group together the results of your report. For Example, you might select Contact Name to group the results by contact. The Display Mode may be either Detail or Summary. If you have selected a summarize option, detail will show all the transactions whereas summary will show only the total of all transactions. The Store Products report will generate a list of all of your store products, along with the number sold of each item, and the number of orders for each item. The report may be filtered by date range so you can see what you have sold over a period of time, by specific categories, or saleable item. Select the Store Products report. To view products in a particular date range, select a predefined date range (i.e. Last Week, Last Quarter, etc.) or select beginning and end dates from the calendars. To view a specific product, begin typing the name of the product in the Product Name text box. If the product exists in your database, the type ahead functionality will display a list of products for you to choose from. If Product Name is left blank, the report will be generated for all products. 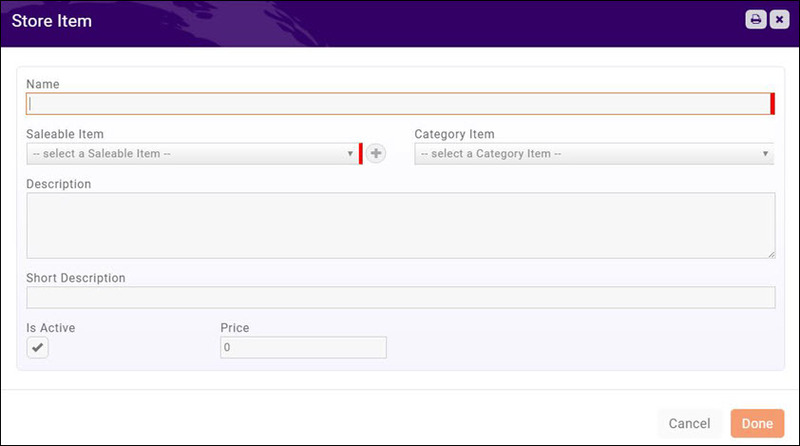 To view a specific saleable item, begin typing the name of the item in the Saleable Item text box. If the saleable item exists in your database, the type ahead functionality will display a list of the items for you to choose from. If this field is left blank, the report will be generated for all saleable items. By default the Fields to Display in the report include: Orders Number, Product Name, Saleable Item, and Total Sold. You may change or add additional fields to your report by clicking into the Fields to Display box. The Summarize By option allows you to group together the results of your report. For Example, you might select Product Name to group the results by product. This page was last modified on 15 March 2019, at 12:19.